Players allocate workers and play visitors to complete various tasks throughout the seasons (each worker is placed on one action each year). In the spring, players decide the schedule their workers will follow. An early rise gives the player the chance to act first; however, offering workers a later wake- up time gives you more valuable bonuses. 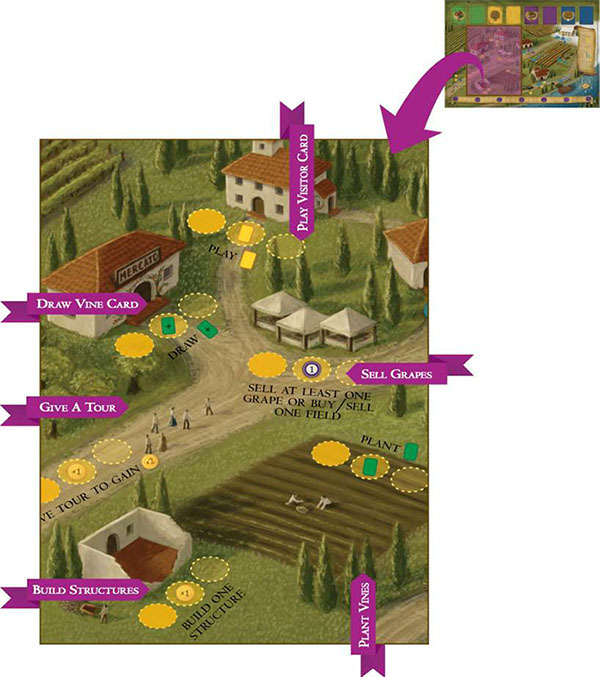 In the summer, players place workers on action spaces to plant vines and build structures that help advance that player's vineyard. In the fall, players invite visitors to help their workers. 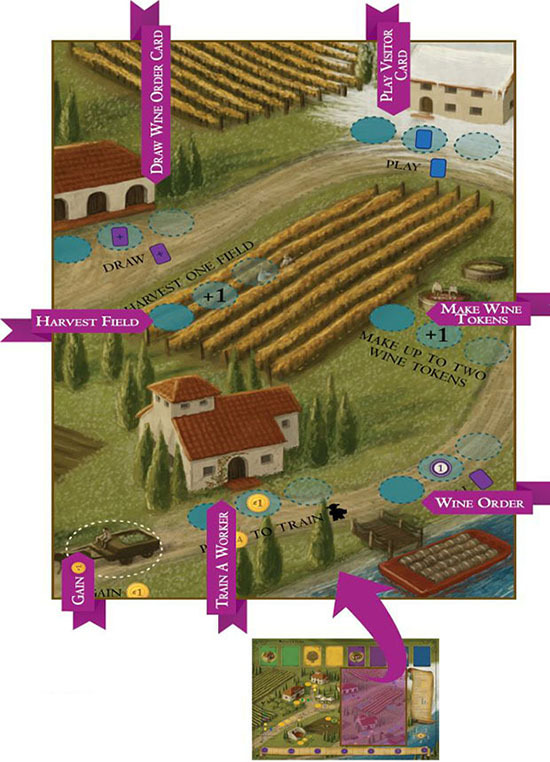 In the winter, players place workers on action spaces to harvest grapes, make wine, and fill orders. The goal is to reach 20 victory points, with victory points representing your reputation as a vineyard owner. When a player reaches 20 points, the current year will be played through the year end, and the player with the most points wins. 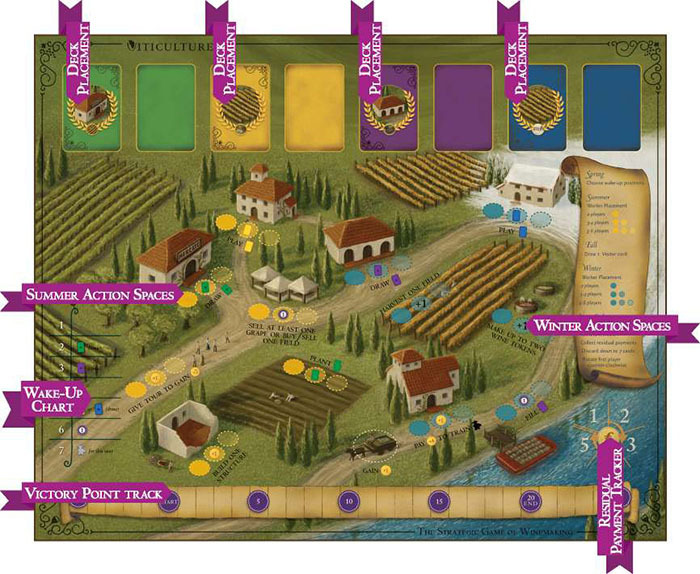 Vineyard Mat: Each player receives a vineyard mat and 3 different field cards: , and . Place them Place them side by side (field side up) on the vineyard mat. Shuffle the 4 decks of small cards (green, yellow, purple, and blue) and place them on the board. Deck Maintenance: If any of the four decks are exhausted during play, immediately shuffle the discard pile and replace the deck. If the deck has been exhausted but no cards have been discarded, that deck is unavailable until more cards are discarded. First Player: Take all of the rooster tokens that have been claimed by players, shake them up in your hand, and randomly pick one. The player with that color is the first player and gets the first player token. Mamas and Papas: After randomly selecting the first player, shuffle the mama cards and deal one face-up to each player. Each player's starting resources are determined by their mama and papa cards. Every mama comes with 2 regular workers. Draw cards as indicated on your mama card to form your opening hand. Do this before gaining resources from your papa card. Every papa card comes with 1 grande worker, and most come with a certain amount of lira. Papa cards also give you a choice: start with a specific structure or gain a few extra lira. Players make this choice in clockwise order starting with the first player. Several papas offer an extra regular worker or a victory point instead of a structure. After all starting resources are accounted for, discard the mama and papa cards. They are only used while setting up the game. Each player places their rooster token above the wake-up chart and their cork token on the space on the victory point track. Each player should also place their wine bottle token on the middle of the Residual Payment Tracker. Note 1: There are negative numbers on the victory point track for a few of the summer and winter visitor cards. A player may not go lower than -5 on the victory point track. If a player has -5 victory points, he may not use a visitor card that requires losing more points. Note 2: All information on a player's vineyard mat as well as available workers, amount of lira, and number and type of cards is public information and cannot be concealed. 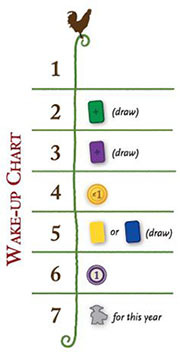 Wake-up chart: Starting with the player holding the first-player token and moving clockwise, each player places his/her rooster on an unoccupied wake-up row. The number represents how early that player wants his/her workers to wake up in the coming year. 1 is the earliest time and 7 is the latest. For workers, the later the better; for the vineyard owner, perhaps not. Helpful Tip: When a player passes during the summer, he will slide his rooster from the left to the right on the wake-up chart for a clear visual of the players that remain active. Then as players pass during the winter, they will slide their roosters back to the left. This will help players see who has yet to pass in the summer and winter. 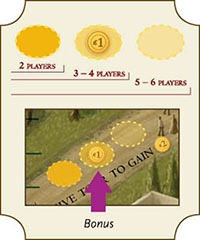 Example: Player 1, the player with the first-player token, chooses the 6 slot and gains a point on the victory point track. Player 2 chooses the 4 row and gains ). So, even though Player 7 has the first-player token, for the rest of the year Player 2 will go first and Player 1 will go second based on where each player placed their rooster on the wake-up chart. Note: The first player to act in the summer, fall, and winter reverts back to the wake-up chart order from the spring of that year. Thus, in the example, above, even if Player 2 (row 4 on the wake-up chart) is the last player to act in the summer, he will be the first player to act in the fall, and then again in the winter. A player may use each worker only once a year. Thus a worker placed in the summer cannot be used in the winter. A player may place multiple workers on the same action in subsequent turns if there are open action spaces. Workers may only be placed on the current season's action spaces. If a player passes, he may place no more workers that season. A player must take the action when placing a worker. For example, if a player chooses the "Plant 0" action, that player must plant a vine. In the 2-player game, only the left action space is available; for the 3 - 4 player game the left and middle action spaces are available; and for the 5 - 6 player game all three action spaces are available. These action spaces may be claimed in any order. Each action space can be occupied by only one worker. Bonuses: Most actions have one action space with a special bonus. A player may take the bonus when placing a worker on an action space with an icon-1 lira, 1 card, +1, etc-on it. A player may take the action and the bonus in any order. The action is mandatory and the bonus is optional. For example, a player cannot place a worker on the "Fill 1 wine order" bonus space to gain without also filling a wine order. The grande worker may be placed on a fully occupied action on the board to perform that action. Multiple players may place their grande workers in this way. A grande worker placed on a bonus action space will give you the bonus (just like a regular worker); otherwise it does not give you a bonus. Example: You are playing a 2-player game and the other player chooses to give a tour with regular worker to gain 2 lira. If you really need to give a tour, you may then place your grande worker on that action (on the art for that action, not an action space) to gain 2 lira as well. Each vine card has a circle with a number representing the value of grape the vine will yield. Some cards have structures in the upper-left corner (irrigation, trellis, or both). The depicted structures must be built before the vine can be planted. Summertime in the came is the time to build your vineyard, co to market, plant vines, put your summer visitors to work, show off your vineyard, and sell crapes. In the summer or winter, a player may place a worker on the cart at the bottom of the board to gain 'i . Placing 1 worker here counts as a player's turn. Any number of workers may be placed on this action over the course of the year by any number of players. Some visitor cards and the Yoke action give players the option to uproot a vine card. To do so, a player selects a planted vine card from their field and returns it to their hand. This action is rarely used; it's there as a backup in case a player needs to reconfigure their fields. Play a summer visitor card from your hand to resolve its effect. Place resolved cards on the summer visitor discard pile at the top of the board. Bonus: Play an additional summer visitor card. Bonus: Draw an additional vine card. Bonus: Gain an additional . 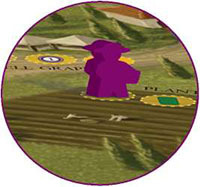 Build one unbuilt structure on your vineyard mat by paying the cost and placing the corresponding structure token on your vineyard mat. 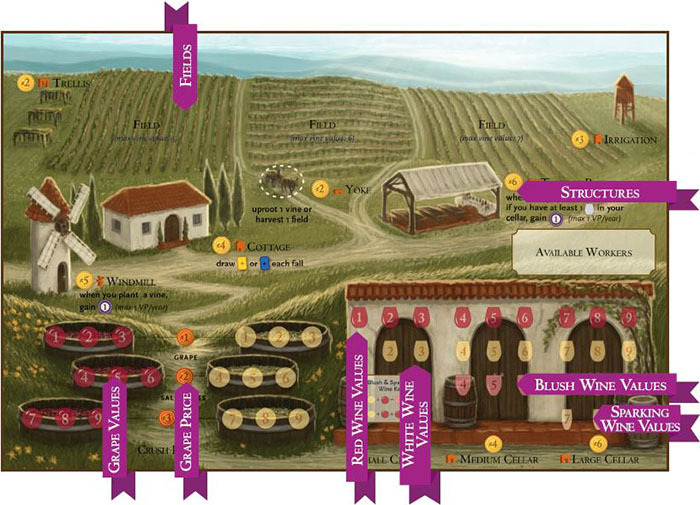 Note: Players may only have one of each structure on their vineyard mat. Plant a vine on one of the fields in your vineyard. Vines are planted by placing a vine card on an empty field, or stacking a vine card on top of another vine that has already has been planted. Once a vine is planted, it stays on the field for the rest of the game, including when the field is harvested. The only way to remove a vine card is to use the Yoke or a visitor card to uproot it. Bonus: Plant an additional vine card from your hand. Note: Afield cannot exceed its max value (5, 6, or 7) when adding the value of the cards on the f eld together.This field currently has a total value of 6. Sell any number of grape tokens (at least 1) from your crush pad for the price indicated by the coin between the crush pads. For example, a 4-value grape token is priced at when sold. Discard the tokens you sell. Alternatively, you can sell one of your fields for the lira amount indicated on the field card or buy back one of your sold fields (same cost as the sale price). You may not sell a field if it has vine cards on it, nor may you plant vines on sold fields. Here is a detailed information about summer and winter visitor cards. Here is a detailed information about the structures. Fall is a time to invite helpful visitors to your vineyard. These visitors will arrive in the summer or the winter to provide a helpful hand on your vineyard. vineyard by drawing a visitor card of his choice. Players take this action without using workers. After a player builds a cottage, the player may choose to draw an extra visitor card every year, but must draw both of the cards at the same time (any combination of visitor cards). Winter is the time to reap what you have sown, turn crapes into wine, find out which wines are in demand, train new workers, put winter visitors to work, and fill wine orders. Draw one wine order card. Bonus: Draw an additional wine order card. Choose one field and add grape tokens to the crush pad based on that field's yield. Vine cards remain on the field when harvesting viticuIturists do not remove vines from the ground when they pick grapes. Bonus: Harvest an additional field. Gain This action space is not limited to 1 worker. Place a new worker near this action space to show that it is now trained but cannot be used until the following year. Note: A player may have no more than 5 workers and 1 grande worker. This limit does not include the temporary worker. Play a winter visitor card from your hand to resolve its effect. Place resolved cards on the winter visitor discard pile at the top of the board. Bonus: Play an additional winter visitor card. Turn grapes on the crush pad into wine. Bonus: Make 1 extra wine token. Fulfill the criteria on a wine order card and then discard it. 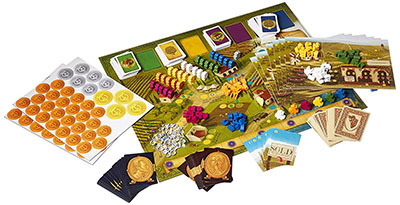 When a player harvests a field, they collect grape tokens from the vine cards on that field. 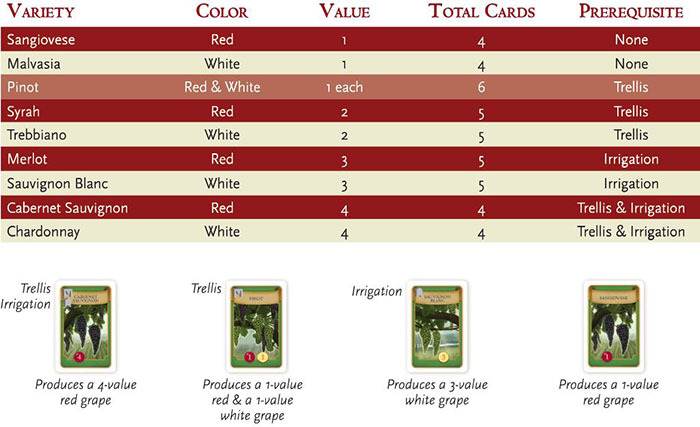 To harvest a field, add the total value of all red grape icons on the vine to create 1 red grape token and then add the total value of all white grape icons on the vine to create 1 white grape token on your crush pad. The vine cards remain on the field. Example: A player has three vines planted on one field. When she harvests this field, she adds the value of the two red-grape symbols (r + 1) on the vines to form a single grape on her crush pad worth 2, and then the same for the two white-grape symbols (1 + 2) to form a white grape worth 3. Each field can only be harvested once per year. Each grape icon on the crush pad can ft exactly 1 grape token. If the grape icon already has a token on it when you harvest a grape at that value, you must devalue the grape token to the next available lowest icon. Thus if the 4-value white grape icon on your crush pad already has a token on it when you harvest afield yielding a 4-value white grape, the new token would instead go on the 3-value white icon on the crush pad (if it's empty; otherwise to the 2-value icon, etc). Make Up to 2 Wine Tokens: Players make wine by converting grapes on their crush pads into wine tokens. 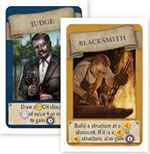 Low-value red and white wine tokens can be created when a player owns only a small cellar, but the cellar must be upgraded to create blush wine, sparkling wine, and higher-value red and white wine. When a player makes more than 1 wine token, the wine he makes may be the same type of wine or different types. Red Wine: Move 1 red grape token to the corresponding space on the cellar. For example, a 3-value red grape becomes a 3-value red wine. White Wine: Move 1 white grape token to the corresponding space on the cellar. Blush: Combine 1 red grape token and 1 white grape token to make 1 blush wine token equal to the combined values of the grapes. For example, a 1-value white grape plus a 4-value red grape creates a 5-value blush wine. 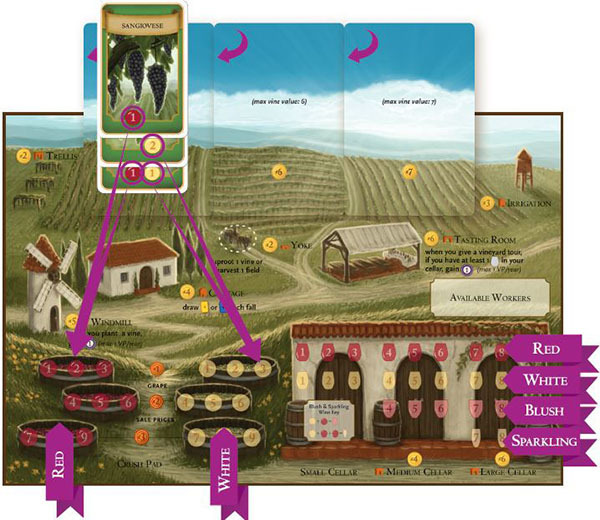 Sparkling: Combine 2 red grape tokens and 1 white grape token to make 1 sparkling wine token equal to the grape value (example 2). Discard excess tokens used to create blush or sparkling wine. Players must build the appropriate cellar to house any wines, blushes, or sparkling wines above a value 0/3 and 6. Each wine icon on the cellar can fit exactly 7 wine token. Once in the cellar, wine tokens may never be combined. A savvy player will make wine strategically based on the cellars he owns and the wine orders in his hand. Crapes in Viticulture age just like wine! Example 1: A player decides to make 2 red wine tokens, but he doesn't have the medium cellar yet. The 1-value red grape becomes a 1-value red wine, and the 4-value red grape is devalued to become a 3-value red wine. 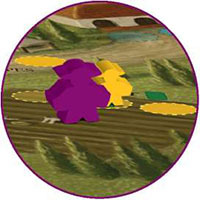 Example 2: The player decides to make a blush wine token, so he combines a red and a white grape to form a single blush wine token equal to their cumulative value. He can only do this because he owns a medium cellar. To fill a wine order, place a worker on the "fill one wine order" action. There are also some visitor cards that enable you to fill a wine order. Select and reveal a wine order card from your hand. The card shows one or more wine token icons with numbers in them. These are the minimum values of the wine tokens you must discard from your cellar to fill this wine order. After removing those wine tokens from your vineyard mat, gain victory points and a residual lira benefit as indicated at the bottom of the card (move your token on the residual payment tracker), then discard the wine order card. This wine order card requires a red wine token worth at least 2 and a white wine worth at least 4. To fill this order, the player reveals the wine order card, removes exactly one red wine token worth at least 2 and exactly one white wine token worth at least 4 from his cellar, gains j points on the victory point track, and moves up *1 on the residual payment tracker. The player then discards the wine order card. Players keep track of residual payments from wine orders on the residual payment tracker. 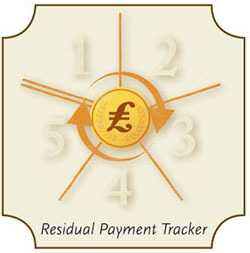 All players begin the game with their wine bottle tokens on the lira symbol in the middle of the residual payment tracker. When a player fills a wine order, that player moves his residual token up on the track based on the lira amount on the wine order card. It remains in that position-do not reset it. At the end of each year, each player gains lira equal to their position on the residual payment tracker (1 = ). The highest residual payment a player can receive is . If they fill additional wine orders, the residual token remains on 5. At the end of each year, players ace crape and wine tokens, remove all workers from the board, collect any residual payments earned from filling orders, and rotate the first-player token counter-clockwise to the next player. Ace Grape and Wine Tokens: Increase the value of all grape and wine tokens on your crush pad and in your cellar by 1 (i.e., a grape or wine token valued at 2 would move to 3 and a 3 would move to a 4). Wine and grape tokens may not have a value higher than 9. Wine tokens can only be aged past the value of 3 if the medium cellar has been built and past 6 if the large cellar has been built. Players do not lose wine or grape tokens if they cannot age them. For example, if a player owns a medium and a large cellar and has red wine tokens valued at 8 and 9, when it comes time to age those tokens, they remain in the same position. Return Workers: Return all workers to their respective players, and return the temporary worker to the wake-up chart. Collect Residual Payments for All Orders Filled: Players collect lira based on their position on the Residual Payment Tracker (max @) per year). Discard Down to 7 Cards: At the end of each year, players must discard their hands down to 7 cards of their choice. Rotate First-player Token: Rotate the first player counter-clockwise and remove all rooster tokens from the wake-up chart. Note: The new "first player" is merely the first player to select his worker placement order on the wake-up chart in the spring. Example: : Aging grape and wine tokens with a medium cellar. 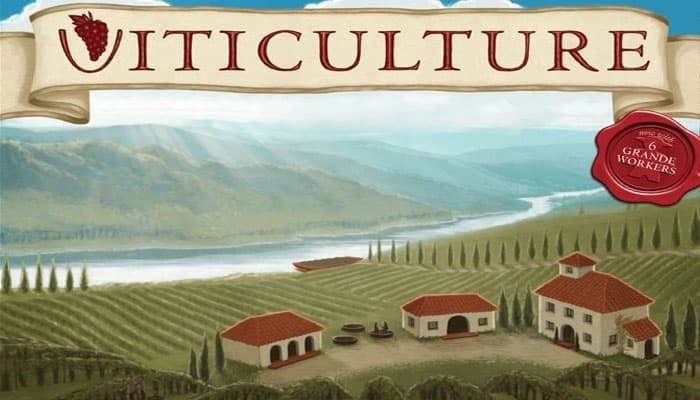 An optional rule for a more casual game of Viticulture is that a player may only choose a bonus action space if he completes that bonus (i.e., play a second summer visitor card) or if there is no other available space on that action. Thus players may not place workers on bonus action spaces to block other players as they can do in the standard rules.